Dicyandiamide (DCD), which is also known as 2-Cyanoguanidine, is a alkaline, hydrophilic white crystalline compound. Dicyandiamide is primarily used as raw material for active pharmaceutical ingredients production for making anti-diabetic drugs. It is also used as a curing agent in epoxy resins and laminates for circuit boards and adhesives. It is also used in production of organic chemicals, which include, water treatment chemicals, slow and controlled nitrogen release fertilizers, dye fixing agents, and pharmaceuticals. Dicyandiamide are of different grades based on purity. The grades include pharmaceutical grade, electronic grade, industrial grade, and others. Currently, pharmaceutical grade dicyandiamide is mainly used compared to other types. The dicyandiamide market is expanding at a significant rate. Asia Pacific is anticipated to dominate the market during the forecast period, followed by North America and Europe. Ultra-micronized dicyandiamide grade is primarily used for epoxy powder coatings, film adhesives, electronic potting, etc. The ultra-fine particles have the storage stability of more than six months, which helps prevent settling and promotes uniform curing. Epoxy systems cured with ultra-micronized dicyandiamide offer superior adhesion, making it a preferred option for adhesive formulations. Furthermore, ultra-micronized dicyandiamide is compatible with all epoxy resins such as bisphenol A, novolac, etc. along with a varied range of pigments and fillers. Moreover, ultra-micronized dicyandiamide is non-toxic. These characteristics give the material an edge over its counterparts. Therefore, the development of ultra-micronized dicyandiamide, especially for epoxy coatings and manufacturing of adhesives and sealants, is expected to provide lucrative opportunities for the dicyandiamide market during the next few years. In terms of grade, pharmaceutical has been a dominant segment for the past few years, and the trend is likely to continue during the forecast period. Dicyandiamide is used in the production of metformin, which is used in the treatment of type 2 diabetes. Rising diabetic patient population across the globe has created a need for the development of anti-diabetic drugs, which, in turn, is likely to drive demand for pharmaceutical grade dicyandiamide during the forecast period. In terms of grade, the pharmaceutical grade segment is anticipated to expand at a significant CAGR during the forecast period. Regions such as Asia Pacific are experiencing major development in the pharmaceutical sector, especially in countries such as China and India. Thus, the market for dicyandiamide is anticipated to expand at a steady pace in Asia Pacific. Asia Pacific accounted for a major portion of the dicyandiamide market in 2017, followed by North America and Europe. The region is anticipated to continue its dominance during the forecast period. The global dicyandiamide market is a highly organized market with a majority of the production taking place in China. AlzChem AG is the only company that has a manufacturing facility outside Asia. End-user industries import dicyandiamide based on their requirements. Major players in the dicyandiamide market are Ningxia Darong Industry Group Co., Ltd., Ningxia Yinglite Chemical Co., Ltd., Ningxia Blue-White-Black Activated Carbon Co. Ltd., AlzChemGroup AG, Ningxia Sunnyfield Chemical Co. Ltd., Shizuishan Pengsheng Chemical Co., Ltd., Ningxia Jiafeng Chemicals Ltd., and many others located in China. Dicyandiamide is extremely reactive, odorless, white powder that is used as an intermediate for production of active pharmaceutical ingredients and a diverse range of guanidine salts. Pharmaceutical grade is a prominently used dicyandiamide grade. The other types of dicyandiamide grades include electronic grade, industrial grade, and others. Other grades primarily consist of ultra-micronized grade and other standard grades. The pharmaceutical grade segment dominated the dicyandiamide market in 2017 and is anticipated to continue its dominance during the forecast period. 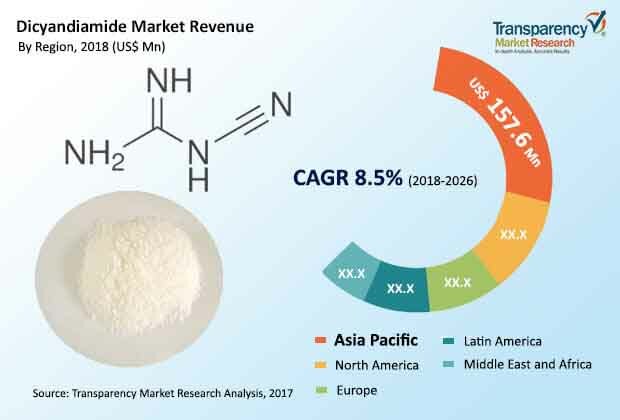 Asia Pacific dominated the dicyandiamide market in terms of volume and revenue, and is likely to remain the dominant region during the period of forecast. Increasing use of dicyandiamide for pharmaceutical and epoxy laminates application is one of the factors for the anticipated increase in demand for dicyandiamide. Also, the rising diabetic population across the globe has created a need for anti-diabetic drugs, which is anticipated to drive demand for dicyandiamide during the forecast period. This report analyzes and forecasts the market for dicyandiamide at the global and regional level. The market has been forecast based on volume (in tons) and revenue (US$ Mn) from 2018 to 2026, considering 2017 as the base year. The study includes drivers and restraints of the global dicyandiamide market. It also covers impact of these drivers and restraints on demand for dicyandiamide during the forecast period. The report also highlights opportunities in the dicyandiamide market at the global and regional level. The report includes detailed value chain analysis, which provides a comprehensive view of the global dicyandiamide market. Porter’s Five Forces model for the dicyandiamide market has also been included to help understand the competitive landscape in the market. The study encompasses market attractiveness analysis, wherein grades and application are benchmarked based on their market size, growth rate, and general attractiveness. The study provides a decisive view of the global dicyandiamide market by segmenting it in terms of grade and application. In terms of grade, the dicyandiamide market can be classified into electronic, industrial, pharmaceutical, and others. In terms of application, the market can be segmented into pharmaceuticals, epoxy laminates, slow-release fertilizers, flame retardants, dye fixing, water treatment, and others. These segments have been analyzed based on present and future trends. Regional segmentation includes current and forecast demand for dicyandiamide in North America, Europe, Asia Pacific, Latin America, and Middle East & Africa. The report provides the actual market size of dicyandiamide for 2017 and estimated market size for 2018 with forecast for the next eight years. The global dicyandiamide market has been provided in terms volume and revenue. Market volume has been defined in tons and revenue in US$ Mn. Market numbers have been estimated based on grade and application of dicyandiamide. Market volume and size have been provided in terms of global, regional, and country level markets. The report comprises profiles of major companies operating in the global dicyandiamide market. Key players in the Dicyandiamide market are AlzChem Group AG, Ningxia Darong Industry Group Co., Ltd., Ningxia Jiafeng Chemicals Co., Ltd., Ningxia Yinglite Chemical Co., Ltd., Ningxia Blue-White-Black Activated Carbon Co. Ltd., Ningxia Sunnyfield Chemical Co. Ltd., and Shizuishan Pengsheng Chemical Co., Ltd. Market players have been profiled in terms of attributes such as company overview, financial overview, business strategies, and recent developments.